This is the first post in a biweekly series that I plan on writing about Japanese religion. Most of us are familiar with certain aspects of Japanese religion – Shintoism, the idea of the kami, Buddhism and the importance of nature in it. These posts are meant to dig deeper, as I investigate scholarly sources to discover the deeper meanings and ideas behind Japanese spirituality. For Christians, this will help us understand the Japanese better in terms of differing viewpoints about spirituality, and for all anime fans, we can better appreciate the subtleties of our favorites series. Speaking of common knowledge, most American otaku are familiar with the veneration given the kami (a complicated term, but often referring to sacred entities) and the buddhas. These “beings” are on a higher plane and are often prayed to on various occassions. However, there is another group, less venerated and less “powerful,” but still honored by the Japanese. Professors Ian Reader and George J. Tanabe, Jr. refer to these individuals as wizards. 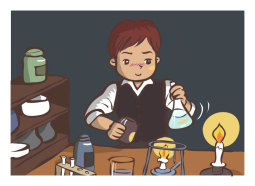 No, they’re not talking Harry Potter or Gandalf – more like Thomas Edison and Heinrich Hertz. These people are clearly human, but their contributions and genius has elevated their positions in Japanese society to that above you and me. And like the kami, these individuals are attributed certain powers. In the city of Yawata, a monument and other pieces exist at the top of the Iwashimizu Hachiman Shrine. They commemorate Thomas Alva Edison, the great American inventor and businessman, whose most important development was the perfection light bulb production. It’s difficult to imagine now, but the light bulb was considered a marvelous invention at the timer. It was greeted with even more enthusiasm in Japan, perhaps, as it also showed how a human could master nature. Even today, Edison is held in high reverence throughout the country; the Japanese ranked him third among historical figures in a 2006 survey. The connection to the city of Yawata goes further, however. During the 1880s, Edison sought a better material to use in the bristol board vital to filament. After his assistants searched the world, they found a suitable material in bamboo from Yawata. Eidson usedit in bulbs through 1894. The message is clear: ask the wizard for the fulfillment of your wishes and remember that the wizard himself succeeded through the ahrd work of trial-and-error. Although the shrine is for a kami, it is Edison who most revered here. Similarly, at the bottom the Hiko Jinja (“Shrine of Flight”), also in Yawata, another “wizard” is honored – this one is home grown. 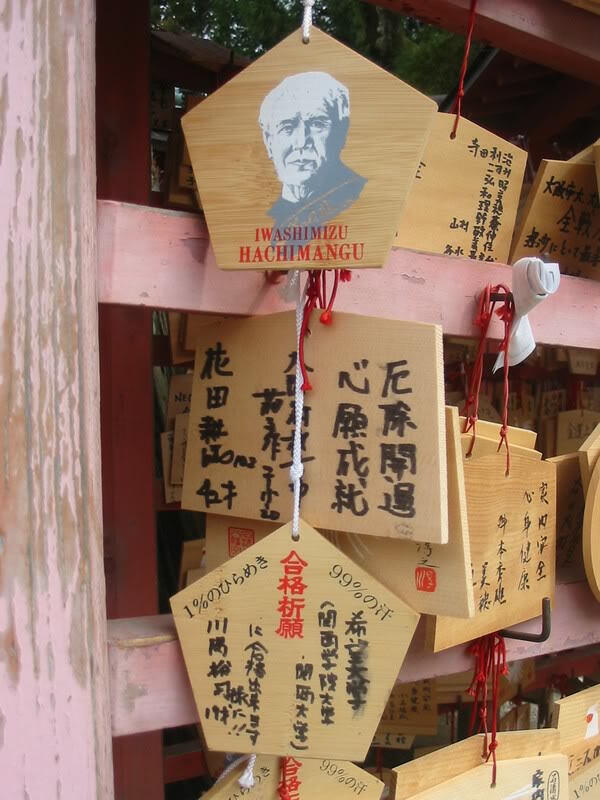 Ninomiya Chuhachi founded the shrine, and his impact in Japan is immense. He is held as a hero in aviation and is indeed an important early leader in the field. Chuchachi flew an unmanned airplane successfull in 1891, 12 years before the Wright Brothers‘ famed flight at Kitty Hawk. 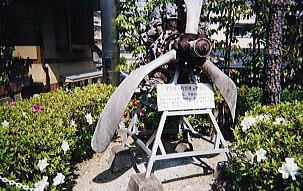 As Edison mastered electricity, Chuhachi mastered flight. In America, we use the phrase “hero worship” when discussing cultural obsession with celebrities and how people, young and old, look up to them. But in Japan, this phrase could be used literally. It’s common in all east Asian countries that dead individuals are revered through what could be called a form of worship, especially when attributed to these “wizards.” In the end, they are a part of a greater system of those that provide benefits for the Japanese when rituals are conducted, which is a significant part of Japanese religion and everyday life. Source: “Practically Religious: Worldly Benefits and the Common Religion of Japan” by Ian Reader and George J. Tanabe, Jr. When I went to Japan a few years ago, I went to the Toshogo Shrine (Shogun Tokugawa Ieyasu mausoleum/shrine) in Nikko. After the Shogun died he was elevated to god-status, posthumously, by the emperor. It kind of reminds me of the pagan Romans who also elevated their own leaders (ceasar) to god-hood. The one thing I realized about Japan is that its polytheism (paganism) stretches in an unbroken line before Christ. I wonder if the People of the Book (Jews, Christians and Muslims) and their monotheistic faith(s) had not conquered the West, would we elevate our great men and women to god-like, or wizard-like, status? Of course, that is me speaking from a Protestant background. The Catholic and Orthodox churches has the institution of sainthood but it’s only for religious, not secular, achievements. That’s an interesting question and one that’s fun to speculate on. Thinking about the heroes of America, I remember that the people wanted to crown Washington as king, he was so revered – only a step away from being considered something more. On the other hand, America’s always been fiercely independent. Even now, I think our country is less patriot than in years past, partially because it’s as individual-focused as ever. We don’t venerate past heroes as much nowadays, as we focus on what we’re doing TODAY. So I would guess if a system of lifting noted Americans to god-like status occurred, it might be broken by now. In Japan, where honoring parents and elders remains an important part of society, it’s no surprise that these “great elders” would almost be worshiped. You are right, patriotism is seen as something abhorrent to our modern, pomo, individualistic national character. However, I wonder if that is a good thing. The rugged, self-sufficient individual has always been revered in America (cowboy, rebel, pirate etc) but is it helping us or hurting us? There is an old adage that says, “The things that make you great can also destroy you.” Denying your past and ignoring your future for the Now is a dangerous precedent. It is a cultural and social myopia that causes apathy and stagnation. Once this sets in, the world passes you by and all you are left with are fantasies disguised as dreams and you cannot move forward. Ah yes, the importance of understanding the past, and with it, the mistakes you’ve made. As a professional historian, I know this idea well! Thanks for the comments, and also for introducing me to the shorthand, “pomo” – ha!